Here’s a quick and easy 2-minute mindfulness exercise we encourage you to try. Find a moment to pause. Take a step back from what you’re doing and simply breathe. Look around you with curiosity for 30 seconds. Name five things you can see, feel, hear, taste and smell in that moment. This quick exercise can easily be built into everyday activities, like when you’re cooking dinner, brushing your teeth, having a shower and eating lunch. It forces you to stop, breathe and take things in. Try this exercise at least once daily for one week. We’re sure you’ll notice a difference. 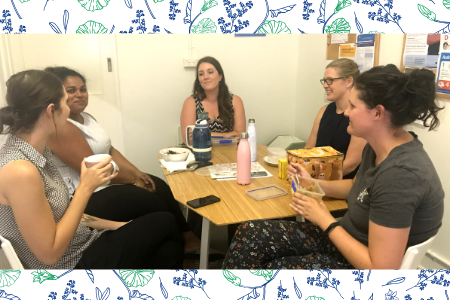 Learning For Life staff practicing being mindful when enjoying their lunch break.